Some things just go together like peanut butter and jelly, ham and cheese or kayaking and maple syrup. Bet you didn’t see that coming! Well after kayaking down the Lamoille (pronounced la moyle) River and then touring the Vermont Maple Outlet, I can say with certainty that these two things DO go together. We stayed at Smugglers’ Notch Resort. One of the activities included in the Resort Information Guide (referred to as ‘the RIG’) is a Morning Maple Paddle. 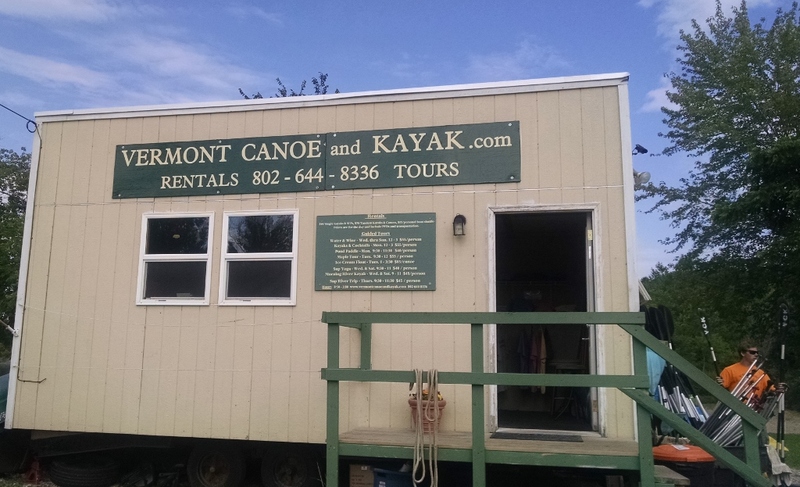 The paddle begins at Vermont Canoe & Kayak, just a short drive from the resort. We were offered our choice of a canoe or kayak. I chose a kayak. There were about a dozen in our group which included adults and some children. I would say the youngest was about six or seven. My point? 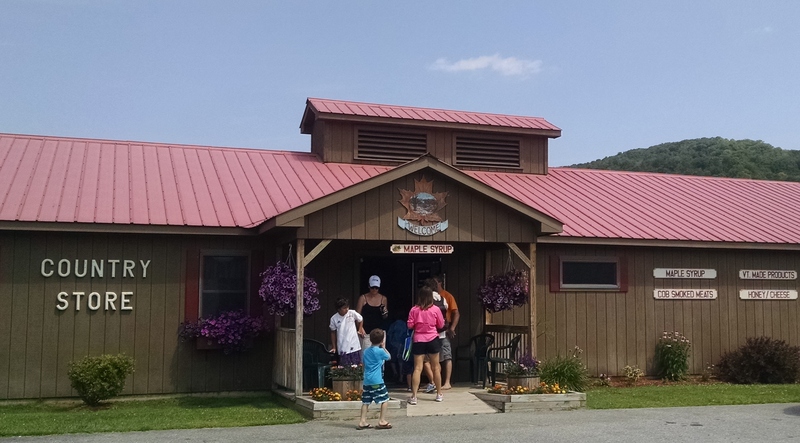 This isn’t white water rafting and is perfectly suitable for families. 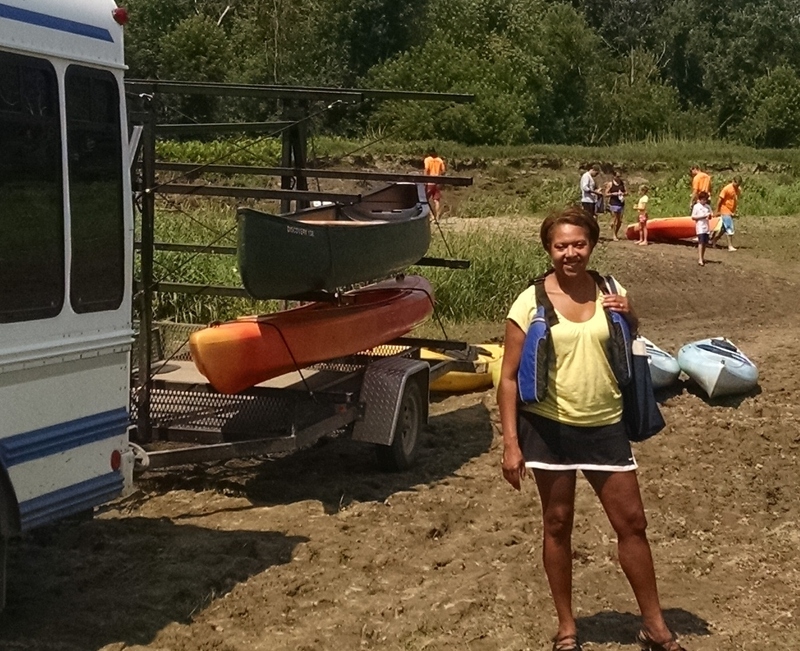 These pictures will give you an idea of the difficulty (or lack of difficulty) of the paddle. What I loved most about it is that it forced me to slow down, and take a look at the nature around me. 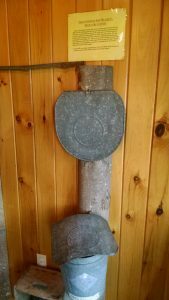 The paddle lasts about an hour and a half. I really enjoyed myself. After the paddle. The right combination of exercise and relaxation. 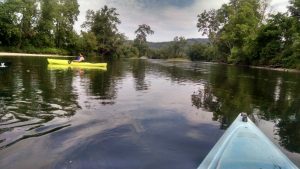 Each group has two paddle guides, one leading the group. And another at the rear making sure that we’re all accounted for. I was near the front and got to visit a lot with our guide, Dakota, who was absolutely delightful. 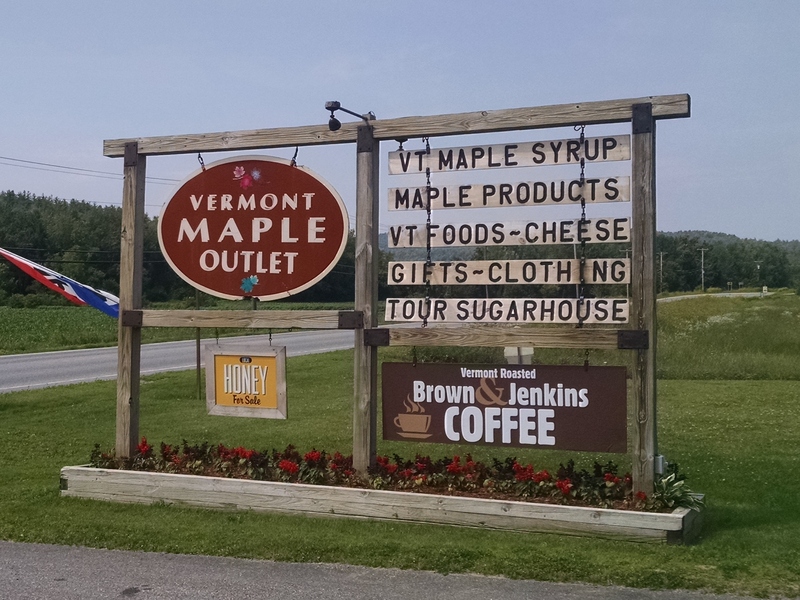 After our paddle we piled onto a bus that took us to our next stop, the Vermont Maple Outlet. I don’t even know where to start. I mean, what can you say about a business that’s been run by the same family since 1810 and is now being managed by a 6th generation member of the family (who’s raising her boys to take it on which will make them the 7th generation)? Amazing! 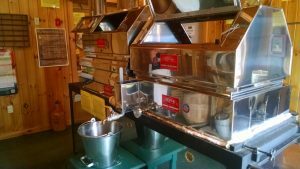 And it’s pretty awesome that each tour comes with your choice of coffee or ice cream and a little sampler of maple syrup. Back in the day, the sap was collected in buckets. Not any more. 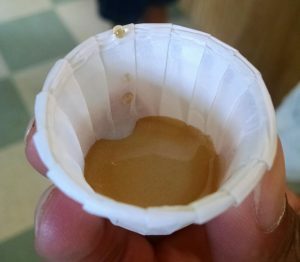 Most sap is collected using a system of plastic tubing. It takes 43 gallons of sap to make a gallon of syrup. Vermont Maple Outlet made 5500 gallons of syrup this past season. As the sap boils down, it evaporates. This is a mini evaporator that they use to demonstrate the process. 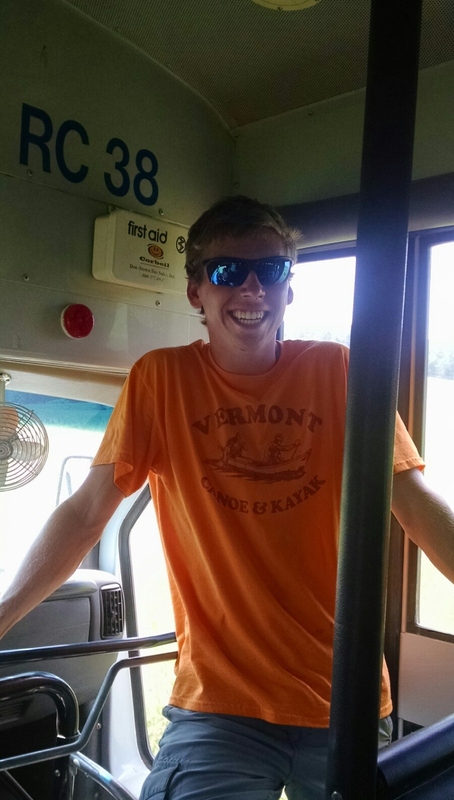 During the ‘sugaring’ season, it’s in full operation for tours to view as they come through. 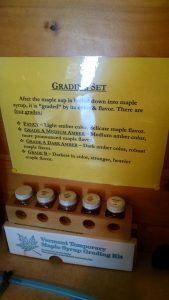 The syrup is graded based on its color and sugar content. 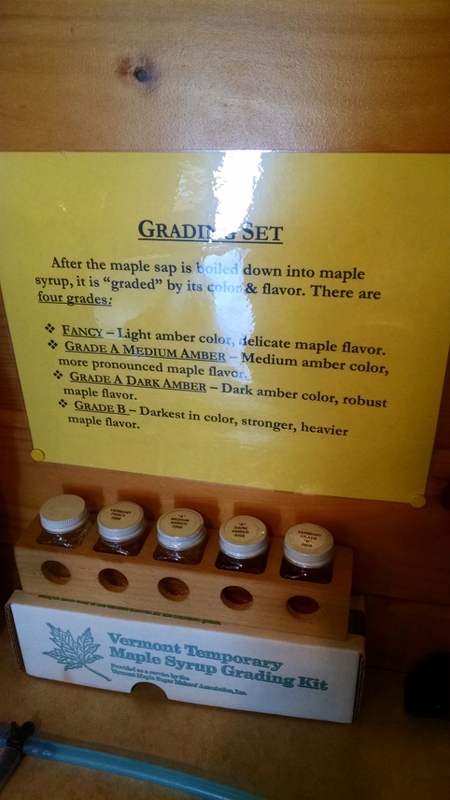 After the tour, we sampled each grade of syrup. My favorite? Grade A, Very Dark. I bought some and we just had it this past weekend with our blueberry pancakes. Delicious!